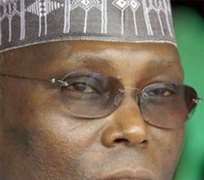 Nigerian ex-vice president Atiku Abubakar is among more than 600 debtors owing five troubled banks some 450 billion naira (2.96 billion dollars, 2 billion euros), the central bank said Thursday. In an advertisement, the Central Bank of Nigeria (CBN) said Abubakar, who was deputy to former president Olusegun Obasanjo (1999-2007), owed Spring Bank 111.15 million naira (731,490 dollars, 491,592 euros). Four other banks with huge loan portfolios are Bank PHB, Equitorial Trust Bank, Unity Bank and Wema Bank. The CBN also listed billionaire tycoon Aliko Dangote, rated by US Forbes magazine as one of the world's richest Africans with a net worth of around 3.3 billion dollars, among the debtors. Dangote, 52, had previously appeared in a similar list released by the CBN in August when it sacked the management of five ailing banks for piling up billions of dollars in bad debts. The CBN accused the management of these banks of giving loans to prominent Nigerian businessmen and companies without adhering to good corporate governance and risk management practices. On October 2, the CBN sacked heads of three of the five banks and appointed new management to run them after it completed an audit of the financial records of 14 banks. The CBN said it would send the fresh list of debtors to the country's anti-graft agency EFCC for necessary action. The Economic and Financial Crimes Commission (EFCC) is prosecuting the directors of the first set of ailing banks for allegedly mismanaging these financial institutions by granting unsecured loans.